On Sunday, the night before Hurricane Sandy struck, Dr. Ford called some of her staff members and asked them to stay near the hospital that night in case they couldn’t get to work on Monday. And she asked them to bring flashlights and water. The forensic psychiatric unit had 61 patients in its care. By Tuesday morning Bellevue had lost electricity and water. 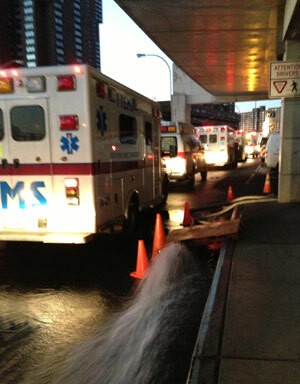 Bellevue Hospital’s fuel pump is located in the basement, which was flooded. 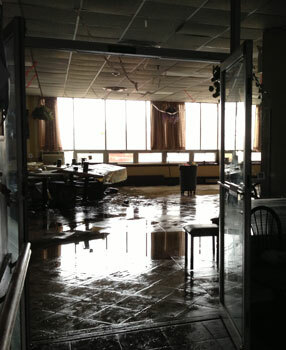 Staffers lugged red canisters of gasoline up 13 flights of stairs to feed the back-up generator, which could supply limited power to only the most crucial parts of the hospital. For the first four days of the storm Bellevue administrators were instructed by city officials to shelter in place. After the official evacuation order came Wednesday afternoon, the National Guard carried patients out of the hospital on stretchers, sometimes down eighteen flights of stairs. Patients who could safely go home were taken there by ambulance. Dr. Benard Dreyer, the director of pediatrics, oversaw the evacuation of 20 sick premature babies from the neonatal unit. “Staff carried one baby at a time — they were all on ventilators — down nine flights of stairs. We just did what we had to do,” says Dr. Dreyer. Meanwhile, anxious parents were home awaiting news of their newborns’ whereabouts. Moving sick babies is risky, but when Dr. Dreyer called Columbia University Medical Center and Elmhurst Hospital, they were ready for the infants. Dr. Ford faced a different challenge since her patients are criminals. “These are not patients that other city hospitals want. That’s just the fact,” she says. Finding safe places for them in the aftermath of Hurricane Sandy was an enormous undertaking. The unit is divided for a reason – certain patients should not interact with one another – but when Dr. Ford made the decision to combine the two groups on Tuesday morning, the corrections team did not object. Laura Raffa, a creative arts therapist on the forensic psychiatric unit, walked patients one by one from one wing to the other, with only a flashlight to guide her. The units were fetid: toilets had been clogged for days. The food supply was running dangerously low. “I made a big pot of chili and brought it in with some chips. It was positively devoured,” she says. Perhaps sensing a low-grade panic among the staff, some of the men became restless. One patient asked Dr. Ford whether the Department of Corrections would remove his handcuffs if he started to drown. Others asked if they could call families they hadn’t been in touch with for years. “These guys feel that level of anxiety and vulnerability all the time, and then with the storm they were really wondering, ‘are we going to be OK?’ and does anyone care?” says Dr. Ford. On Wednesday, Dr. Ford held another meeting and told her patients that because of the storm, Bellevue was not a safe place to be anymore and they were preparing to transfer everyone to another facility. Psychiatric patients are usually admitted to a hospital, treated and discharged to a supportive place, ideally with family. Forensic psychiatric patients at Bellevue are typically discharged to Riker’s Island. 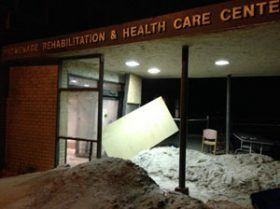 Before they leave the hospital psychiatrists conduct a risk assessment to ascertain how dangerous the discharge site is going to be for the patients: are they likely to be victimized? Are they likely to assault somebody? Are they likely to stop eating and get locked in their cell? By Thursday morning, 26 patients were left on the forensic unit. Dr. Ford decided that these patients, ranging in age from 16 to 65, needed more clinical care and protection than Rikers could provide. After she spent many hours pleading, the Central New York Psychiatric Facility in Utica agreed to take them. At 6 a.m. the patients began the trek out of Bellevue. Moving the criminally insane is not like moving other patients. The prisoner-patients donned orange jumpsuits and were daisy-chained (shackled by their ankles) in groups of six. Laura Raffa worried that if one patient fell, he would take the rest down too. Four armed corrections officers — two in the front, two in the back — escorted the men down 19 flights of dimly lit stairs. Outside, a corrections-office bus waited to take them to Utica. The Department of Corrections does not allow civilians on the bus so nurses followed behind in cars. There would be no stops on the five-hour drive. Dr. Ford recalls getting teary eyed when the bus pulled away. “It just was not an ideal situation,” she said. When they arrived in Utica, the patients were hungry, tired, and after three days with no water, in need of a shower. There were no bathroom breaks on the way and some patients were covered in urine and feces. The Central New York Psychiatric staff was prepared with a hot turkey dinner, then provided showers and flannel pajamas. Bellevue did not re-open for three months after the evacuation. During that time Dr. Ford visited her patients in facilities around New York. Most wanted to know about their next court date because court dates offer the potential for release. Others, despite being cut off from family a long time ago, wanted Dr. Ford to let their moms know that they were OK.
Hurricane Sandy forced Bellevue and many other institutions around New York City to re-evaluate their disaster response plan. “As far as I know there was no evacuation plan in place before Sandy,” says Dr. Ford. Earlier this month, the New York City Health and Hospital Corporation sent a newsletter stating they were working on infrastructure concerns, communication upgrades and mental health services. Fuel and drinking water pumps will be moved to the first floor and some elevator shafts will be shielded so crucial elevators will function in the event of flooding. A new system will notify people in the event of an emergency via email and cell phone until receipt of the message is acknowledged. In addition, the hospital promises to be prepared to deal with staffers experiencing psychological trauma, by providing post-crisis counseling services. Dr. Dreyer and his wife Constance are two wonderful and commuted persons. I had the honor of renovating Drs family home off the Whitestone yes ago and the times we shared were special. Thank the Lord for his caring nature.